"I want to purchase the plans for the corner pergola but cannot access how to do it"
"I see from my records that you downloaded the plans. The download process should run smoothly. There should be a link in the 'Thank You' email that gives the download link. What I suspect has happened is that the email sent from e-junkie (who are the digital delivery system) has been put in the 'spam' folder of your email. Take a look there first. After downloading, you will need Adobe Reader in order to read the plans, as, like most downloaded e-products, the plans are in pdf format. If you don't have Adobe Reader, you can get it for free here ." "I am considering buying your corner pergola plan. I would need to adapt dimension across each back to 7'9". How easy would this be? 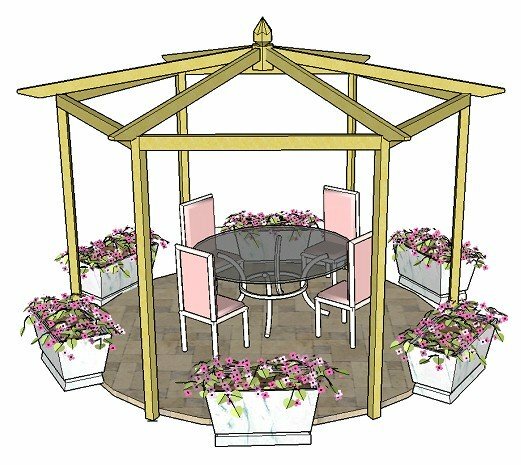 My wife has seen the design she wants, which is called a "Decking and Corner Pergola Kit by Rowlinson" but can't buy without the decking so I will have to build one as close as possible to this design. From your picture yours looks very similar. Maybe I am asking too much but could you google it and let me know if this can be achieved using your plans." 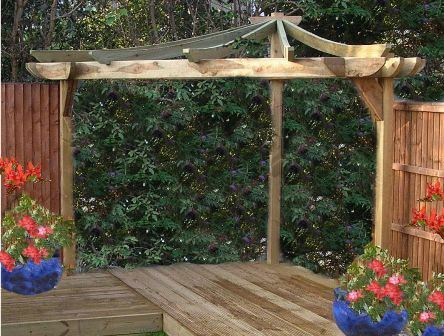 "I know the pergola you are talking about well, and it is a shame that Rowlinson only produce it with the decking attached, as it is convenient to use a kit. However, you are certainly not asking too much in terms of adapting the plans to fit your own situation. This can be done easily, and is covered in 'Adapting the Plans' section. The plans allow for all footprint dimensions and even timber sizes. I think the Rowlinson pergola is constructed with 4" x 1" rafters, whereas my plans use 6" x 1 1/2" rafters, but the plans allow for any size of timber. 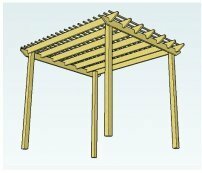 If you do use 4" x 1" rafters you can use the pergola rafter tail templates for the free plans, as they use this size of timber(found on left navigation bar under the 'Free Plans' section). If you are not using trellis, the plans are very easy to adapt. If you are using trellis, rather than making the pergola fit the trellis panels, you will make the trellis fit between the posts by cutting them down(which is easy), attaching the trellis with corner braces on the cut edge. This is all explained in the plans. The bonus is that it will be considerably cheaper than buying a kit!" you and have a question. Could I build the pergola without posts 6 and 7 ie. make it triangular? It is to fit over some decking I am installing so posts 6 and 7 would encroach onto the decking. I am likely to use similar dimensions to your standard plans ie 8" 9' sides." down the seating area. I would mark it out and see what you think. posts, I would notch the corner of the post by measuring 6" down, and the depth of your rafter in, so that the diagonal sits on the top of the post. against the main rafter. I think you will need 2 more radiating rafters to fill in the spaces where the side rafters were. The length of the diagonal rafter will be quite long. Using a 6" x 2" rafter will give it more strength, but I would do as you suggest and add another diagonal between posts 2 and 4, notching the posts and cutting the rafter ends as before. It's a bit more work notching, but better to be safe than saggy! the picture was concreted in 2' with 8' above ground. I hope this helps, but if you do have further questions or need more clarification then feel free to reply to this email and we'll take it from there. Do you have any plans for an Asian corner pergola? I'd like to have a go at building one. similar to the dragon pergola kits that you see around. It really will be a stunner, I think! ii) I was trying to tell from the pictures but do all the joists radiate from the corner? Those dimensions should just about be OK. You can either add another post to give 3 along each side instead of two, placed every 4', or position your posts at about 6' instead of 4', keeping 5 posts only. 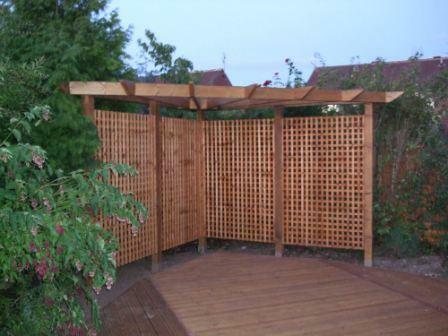 The corner pergola on the picture has been adapted to include a recess at the back. The plans, however, are indeed written so that the rafters radiate from a central point/apex. This is one of the most satisfying pergolas to build and looks really good too. The plans will still work with any size of wood. If you need any further help, please feel free to reply to this email. Thank you for your prompt response. 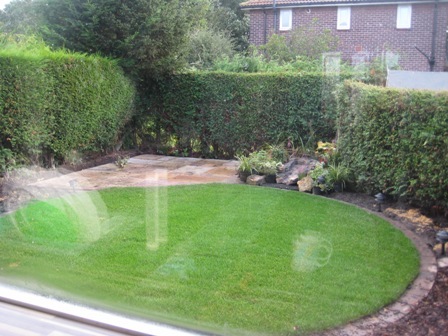 I have attached pictures of my garden. I am looking to buy/construct a corner pergola. As you can see I have hedges as my bounder. I would like the pergola to be right up against the hedges. 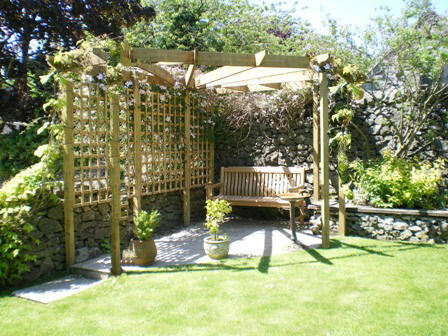 However I would have really liked trellis panels at the back of the pergola but have no space to plant climbers. The only speace I have for a trellis is at the left hand side of the bedding where it joins the circular paving. At the other end is a water feature and I would like to plant a tree at the back of the cascade to provide privacy from onlooking neighbours. I would like the pergola to grow climber ramblers. I am not sure if I can get then to grow at the top of pergona as I dont know where to put any trellis. How would it be supported? I want an L shaped wicker sofa up against the pergola and want the entrance of the pergola to be open. Hope it all makes sense. The main thing that stands out for me when looking at the layout of the area is the fact that you need to be able to cut the hedge! Therefore trellis isn't really an option. Then use the actual posts as supports for less vigorous plants such as clematis, which can be planted in large pots. These can be under-planted at the base with trailing rockery plants or annual bedding plants, which will keep the roots of the clematis cool. If planting in pots make sure your climbers are watered and fed. However you construct your pergola - self build or kit - think carefully about how and where you are going to fix the posts. There may be enough room to sink posts into the ground outside of the paving. If not, make sure you order bolt-down post anchors, which are bolted onto the paving itself. 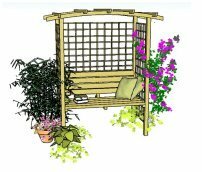 A different option might be to take a trellis panel behind the pond, joining it to the end post of the pergola and sinking another post to support it on the other side of the water feature, growing climbers up this trellis panel too. The L-shaped sofa sounds great.